The following synopsis comes from Aprilynne Pike's website. Sixth months have passed since Laurel saved the gateway to the faerie realm of Avalon. Now she must spend her summer there, honing her skills as a Fall faerie. But her human family and friends are still in mortal danger--and the gateway to Avalon is more compromised than ever. The cover of Spells (above) most definitely fits with the Wings cover. I am all about coherent book covers. What I did not realize from the picture, is that, the tips of the flower on the lower corner are sticking out of water and are not glossy; they actually look as if they are sticking out of water. It's so cool! I fell in love with Laurel's story in Wings and I found Spells to be a great followup on her. She's a strong, independent girl that is facing many trials: her mother is distant, she has two boys after her heart, trolls are hunting her, she has to go to Avalon and learn how to be a Fall faerie, and much more. My favorite part of Spells is the scenes in Avalon. The way Aprilynne Pike describes Avalon made me feel like I was there. I could feel the beauty of this magical place rolling off the pages penetrating my thoughts. It was so easy to see the wonder and beauty of this world and I truly wish it existed and, of course, that I was a Fall faerie like Laurel so I would be granted entry. Tamani is a nice bonus as well. She has created a vibrant world that I did not want to leave. I became fully enthralled with Avalon. The story unfolds in a way that allows the reader to become attached to Avalon and, if the reader hasn't already, the characters. In Wings, Laurel did not go to Avalon, so the reader can't really appreciate the amount of protection that the Fae use in order to protect it. Spells allows readers to see into this world and become absorbed in it. Laurel and David's relationship grow in this installment and it becomes evident why she chose David. Personally, I thought it was no contest: Tamani all the way! But, Spells gives more depth to both David and Tamani. 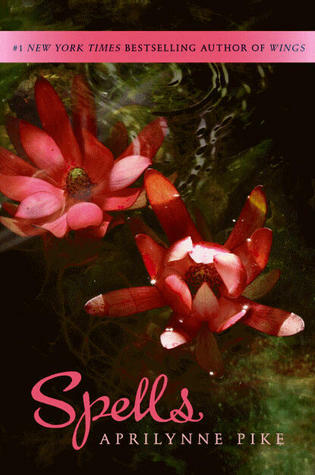 Spells is beautifully written and easy to read. I had so much fun in Laurel's world and I am DYING to see what happens next. I love the ending of Spells as it definitely sets up for Enchantments and leaves me yearning for more.